Long before "No Waste" became a buzzy food world concept, it was a strict mandate at my home when I was growing up. Coffee grounds and eggshells went in with the plants, dry bread was saved for crumbs, and all vegetable trimmings, scraps and bones went into the freezer, to be used later in soup. Maybe that's why I've been making stock (or broth) for as long as I can remember. In my house now, stock-making knows no season—it's time whenever I can't cram another thing into the freezer. And that, in turn, is dependent on how often we break down and/or roast a chicken, and how many vegetable and herb scraps have accumulated. No matter what goes into the pot, though, the stocks are always great—in the winter, they're more deeply flavored, darker and sweeter, with carrot, parsnip, mushroom and onion trimmings, and bones; summer stocks are lighter and often vegetarian, packed with trimmings or languished-too-long-in-the-fridge tomatoes, spring onions, snap peas, bell peppers, summer squash, and leafy green and herb stems. 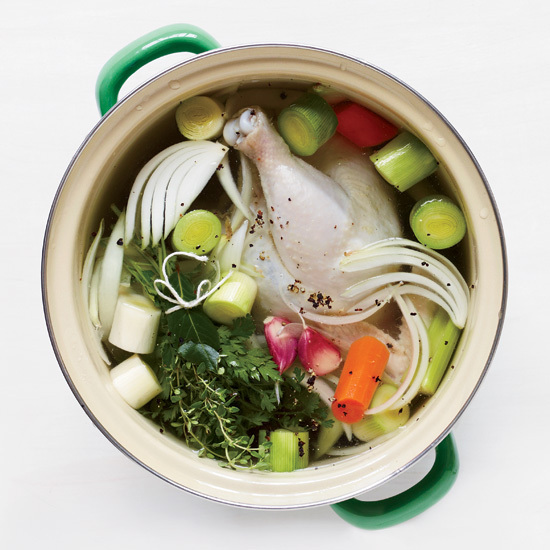 We often associate the act of making stock with winter, but maybe summer is the best time for it after all: The vegetables and herbs are fresher, tastier and way cheaper, and the simple things you'd make with it at this time of year—a quick soup or braised vegetables, risotto, poached fish, a lightly sauced pasta—benefit from the clean, vibrant flavor you just can't find in a can. Here's a good vegetarian recipe to start with—feel free to add to it as you please.